Ron and Valdomiro during their weekly Discipleship meeting. 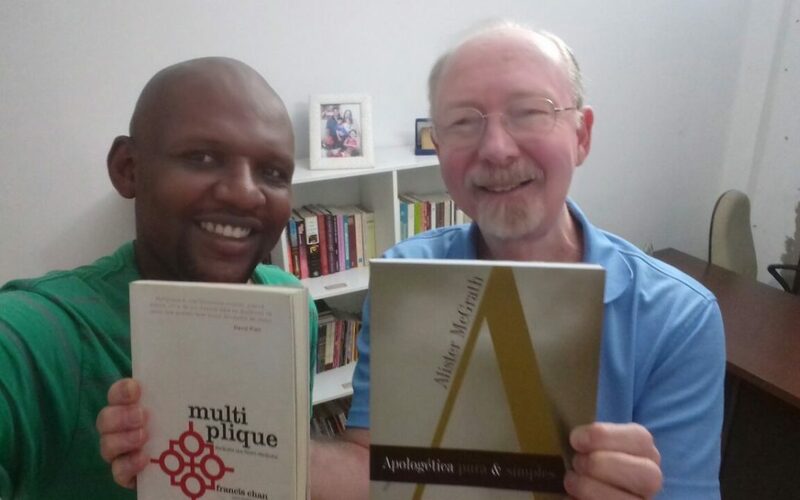 When Valdomiro and I meet for discipleship we spend time discussing the implications of what we are reading for God’s purpose for our lives through the lens of Scripture. We also spend time discussing how our week is going and the thanksgivings, challenges, and opportunities for growth into the likeness of Jesus Christ, our Lord, Savior, and Friend. We also catch up on the thanksgivings, challenges, and opportunities Valdomiro is experiencing in his discipleship of other men in our parish. This is my thanksgiving for discipleship in Brazil; I consider myself to be a novice with the Portuguese language and Valdomiro does not speak English. Our conversation in Portuguese at times can be both intense and full of emotion, and sometimes Valdomiro needs to restate his thought for me using simpler words. Valdomiro also is patient with me and calmly corrects my numerous grammatical and pronunciation errors especially if I rush my delivery and, for example, I’m talking in the future tense when I should be talking in the past. Last week Valdomiro asked me if we could increase our discipleship time from one hour per week to two hours per week due to the intensity of the content of Alister McGrath’s book so we do not miss out on the other aspects of our time together. Of course, I said yes, and praising the Lord, almost fell off my chair! I took this as a testimony to the power of the Holy Spirit in the lives of two people who not too long ago could not understand a word the other was saying. Now we are both Making Disciples Who Make Disciples only for the Glory of God’s purposes for His Creation. Ron and Debby Mckeon serve in the Anglican Diocese of Recife in Brazil. 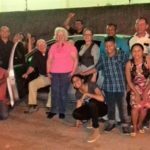 They are dedicated to helping the Anglican churches in Joao Pessoa grow spiritually, numerically and missionally. Please prayerfully consider giving to support their mission here. The U.S. Consulate General in Recife alerts U.S. citizens of an increase in criminal activity in public transportation in all northeastern states. According to the media, in Pernambuco specifically, criminal activity in public transportation is 97.2 percent higher than last year. Criminals have typically targeted bus drivers and passengers to steal cellphones, wallets, jewelry, and purses. 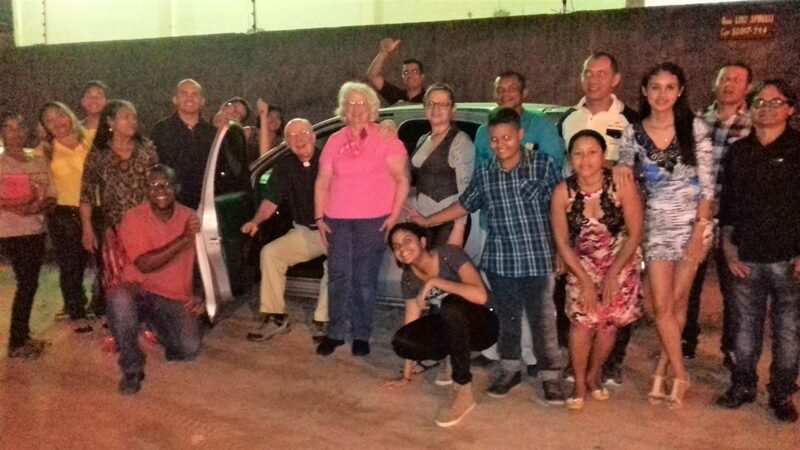 Our congregation at Cristo Libertador giving thanks to God and our financial supporters for this wonderful gift of a car. We believe we are in the place God has called us to be. Ron is now discipling some of the men in our home parish as well as his regular ministry duties, all in Portuguese. Debby is currently teaching several classes on intercessory prayer, a new ministry that began in February, written in both English and Portuguese, but still using a translator for pronunciation purposes. Debby continues with the soup ministry twice monthly, which is also good practice for her Portuguese, during all the soup preparation and serving with the team of ladies. In addition Ron has been called to assist our Suffragan Bishop in his new role as the Diocesan Missionary Bishop to reach the unchurched and underserved with the Gospel across Brazil. Ron will assist the Diocesan Missionary Bishop Flávio Soares to spread the Gospel of Jesus Christ and God’s immeasurable love through planting new communities of faith throughout Brazil. More details on this new startup ministry to follow after the special Diocesan Synod in May. We hope as Spring approaches that any lingering snow has become a memory, and that you are being blessed by God. We are thinking of our many wonderful friends today and are praying for your work, ministry, health, family and church congregation. We have had good reports regarding Ron’s health. First it was evident from his improved energy level, and then confirmed by the bone scan in December that showed no evidence of infection and also an ultrasound of the soft tissue in January that was also clear. He remained on a once a day antibiotic until the first week in March, and thus far none of the previous symptoms have returned. We are so thankful and give the glory to God.